One of the major icons of Tasmania is, of course, the Tasmanian Devil. Tassie Devils are amazing little animals. They are carnivorous marsupials (meaning they carry their young in a pouch) only found wild in the island state of Tasmania, Australia. About the size of a small dog (or large cat) Tassie Devils are rather ungainly in shape and movement, but can also be quite cute! Named Devils by the European settlers because of their loud and ferocious screeching while feeding, they are mostly carrion feeders, not hunters, owing to their poor eyesight. However they have a keen sense of smell and when eating can devour every part of a carcass, including the bones! Tasmanian Devils are an icon of Tasmania, however it is quite rare to see them in the wild. If you want to see a Tassie Devil in Tasmania, your best bet is to visit one of the following nature parks. Now you just need to decide which! Bonorong is the closest place to Hobart to see Tassie Devils as well as lots of other native Tasmanian animals. The sanctuary takes in injured wildlife and either rehabilitates or homes the animals permanently. 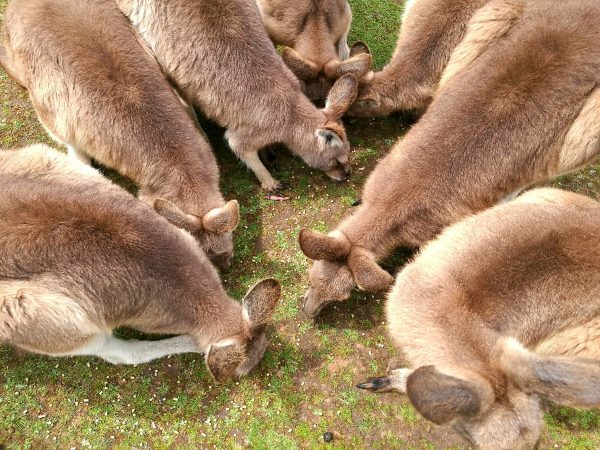 Visitors are able to feed kangaroos and pat wombats and koalas on one of the daily tours. Daily tours also include Tassie Devil feedings and Bonorong has extensive habitats for the 20 Tassie Devils that are part of a breeding program to ensure they don’t become extinct. – The Salamanca Markets – one of Hobart’s most popular attractions, every Saturday! – Tasmanian Museum and Art Gallery – a fantastic museum for Tasmanian history as well as information about Antarctica, and lots of colonial art. For a more detailed post about my recent visit to Bonorong have a look here, and check out their website when planning your visit! Zoodoo is located very close to the historic town of Richmond and features a number of native Tasmanian animals as well as more exotic ones from around the world. Zoodoo offers lots of ‘hands on’ and up close and personal encounters with their animals; including hand-feeding, a ‘safari’ tour, walk-through aviary and the options of personal encounters with specific animals at the zoo. 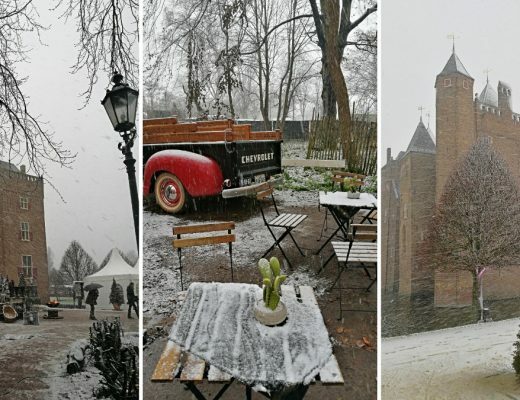 For planning your visit check out the Zoodoo website here and you can also read my detailed post on lots of other awesome things to do in Richmond here! Located on the Tasman Peninsula about an hour and 15 minute drive from Hobart is the unique project of the Tasmanian Devil ‘Unzoo’. This wildlife park aims to be less like a zoo or park and try to make the habitats as natural as possible. 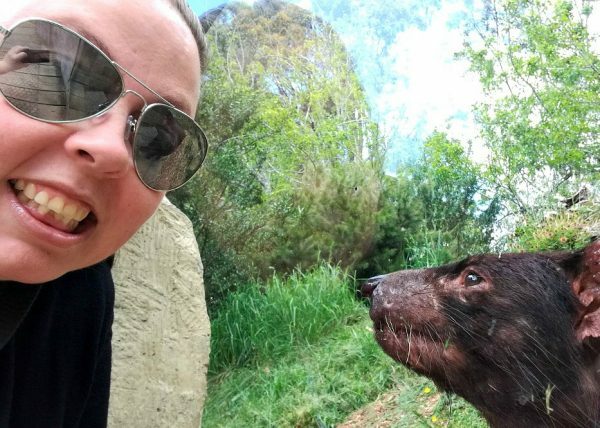 They also have a great deal to do with the conservation efforts for Tasmanian Devils and have lots of Tassie Devil encounters; you can even get nose-to-nose with them in the devil dome! – Doo-Town – a little shanty-town where nearly every house is named something with “Doo” in the title! Have a read here about my recent visit to the Unzoo, and make sure you check their website when planning your own visit. On the East Coast of Tasmania in the town of Bicheno is the East Coast Nature World; a nature park situated amongst 150 acres of parkland and lagoons. 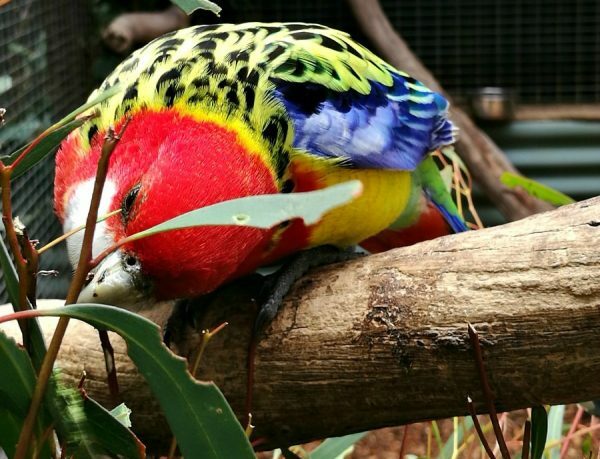 You can feed lots of native wildlife here as well as explore their special ‘Devil World’ educational centre, or walk through the aviaries and get close to parrots, ducks, pheasants and cockatoos. – Wineglass Bay – you’ve probably seen photos of this gorgeous spot! The Natureworld website can be found here. 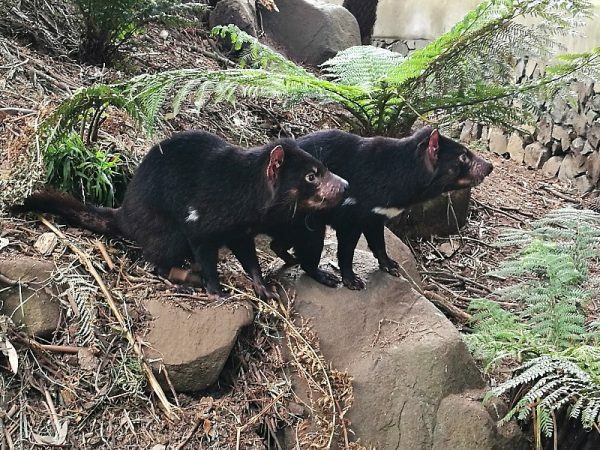 Located within the Cradle Mountain National Park in the North-West of the state; Devils @ Cradle focus on the three carnivorous marsupials found in Tasmania: the Tasmanian Devil, Spotted-tail Quoll and Eastern Quoll. Close to Cradle Mountain Lodge, Devils @ Cradle is the perfect place to go for a very intimate and focused encounter with Tassie Devils and Quolls. The conservation facility also works very closely with conservation efforts in the state. Check out the website for Devils @ Cradle here. Only about an hour and 40 minutes away from Devils @ Cradle is the Trowunna Wildlife Park at Mole Creek. With an emphasis on conservation and education, Trowunna is a great place to see Tassie Devils and other native animals with interactive tours. With a variety of micro-habitats you can also see native amphibians, reptiles, birds and mammals. Some are being rehabilitated and others are simply passing through! While you’re in the area you can easily visit the Cradle Mountain National Park but you should also stop by the very unique site of “Tasmazia and the Village of Lower Crackpot” (website here). A crazy complex featuring 8 mazes, a model village built to 1/15th scale and a lavender farm it is definitely a place worth a stop on your journey for visiting Tasmanian Devil parks! Plan your visit to Trowunna through their website here. Situated about a 25 minute drive from the city of Launceston, the Tasmania Zoo is another site that combines native animals with more exotic ones in their facilities. They are also dedicated to conserving the Tasmanian natural wildlife but here you can also see primates from around the world as well as meerkats, crocodiles, otters, camels and lions. They are also the only zoo in Australia to house Black Crested Macaques. – The Cataract Gorge – a stunning bit of wilderness in the city, featuring a chairlift, swimming pool, lots of pretty walks and peacocks! – The Penny Royal Adventures theme park – I remember going here as a child and it was so much fun! You can find the Tasmania Zoo website here. 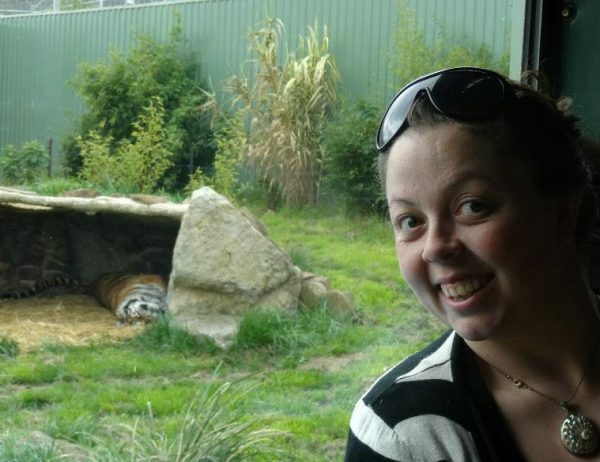 Also located quite close to Trowunna Wildlife Park and Devils @ Cradle is the Wings Wildlife Park. The largest wildlife park in Tasmania with the largest collection of Tasmanian wildlife, Wings also features accommodation and includes an aquatic section where you can view native fish species such as the Rainbow Trout. They have Tasmanian Devils and other native animals, as well as American Bison! Ideally situated near the port city of Devonport, if you are looking to drive from mainland Australia to Tasmania then you can catch the Spirit of Tasmania ferry from Melbourne to Devonport. This is the ideal way to visit Tasmania as public transport is not widespread throughout the state. Alternatively you can hire cars from either the Launceston or Hobart airports. Have a look at the Wings website here. 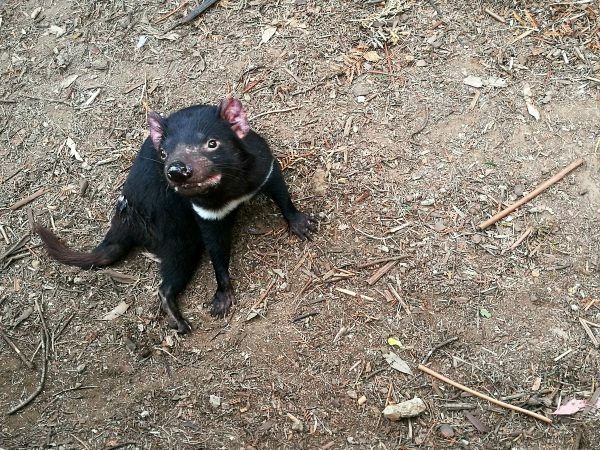 As you might already know (and you soon will as soon as you visit any of these places) the Tasmanian Devil is at risk due to a contagious facial tumour disease. Recently a possible cure has been discovered, but there is still a long way to go to make sure these unique little creatures continue to live in the wild in Tasmania. By visiting any of these destinations your money will be helping with conservation efforts and research into the disease. So definitely do that! 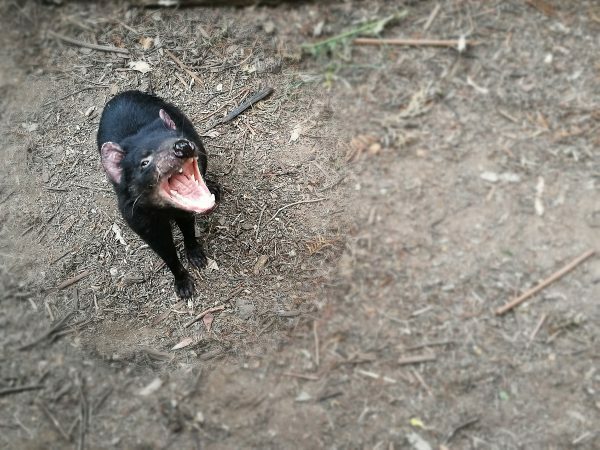 If you want to do more to help the Tasmanian Devil you could donate directly to the Save the Tasmanian Devil Campaign at their website. 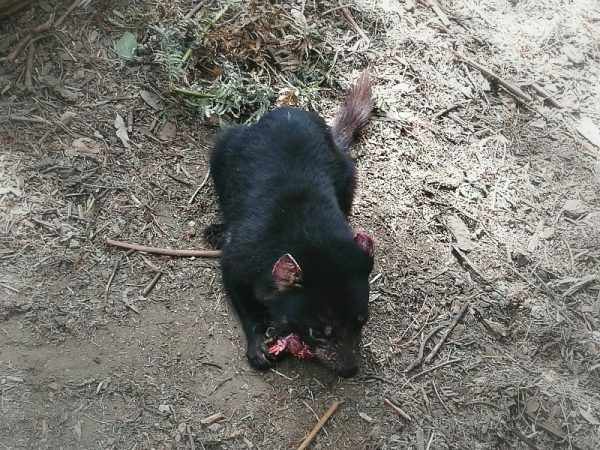 If you are driving in Tasmania remember to slow down between dusk and dawn as Tassie Devils are scavengers and often to be found eating roadkill and then becoming roadkill in turn. Let’s all help keep the devils around for many years to come! Would you like this guide in printable e-book form to help you with your own Devil-sighting plans? Sign up below and you can have all the information included here (plus a map!) to make your own adventure around Tasmania to see Tassie Devils even easier! 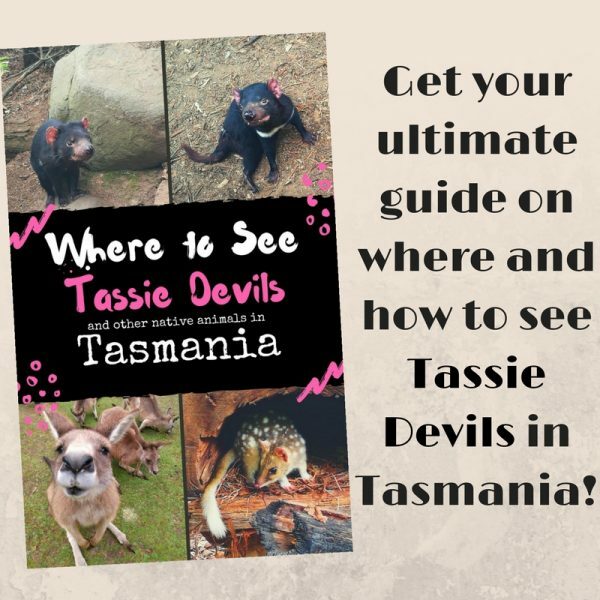 Sign up for your free copy of “Where to See Tassie Devils and Other Native Animals in Tasmania”! Have you ever been, or are you planning to visit, Tasmania to see Tassie Devils? Let me know in the comments and pin one of these to help with your Tassie Devil sighting plans in the future! So funny! I was just reading another post from Tasmania and all I can think of are Tasmanian Devils, from the cartoons, of course! I wasn’t even sure if that was an actual thing, or made up for cartoons. How fun to see them in person! Great post! We’re off to Tassie in May. Can’t wait to try and find some Tassie devils mysef! I’d love to visit this part of Australia and see these places. It must be amazing seeing the Tasmanian devils in the wild. It’s such a shame to read about them being at risk from a facial tumour disease. You definitely should visit Australia (and Tasmania) if you ever get the chance! It is sad about the disease, but hopefully they may have a cure in the works! That’s a good list!! Do you know how hard it is to see one in the wild? We saw plenty of wildlife in Tasmania but we had to go to a sanctuary to see Tasmanian Devils! Yep, they are very hard to see in the wild as they’re nocturnal and pretty shy. I lived in Tasmania for 23 years and never saw one in the wild! They totally are! Haha, I’m so glad, you definitely should visit Tassie when you get the chance! This is so awesome! I’ve only ever seen them at a wildlife park in Victoria, but I’d love to see them again! Great blog! 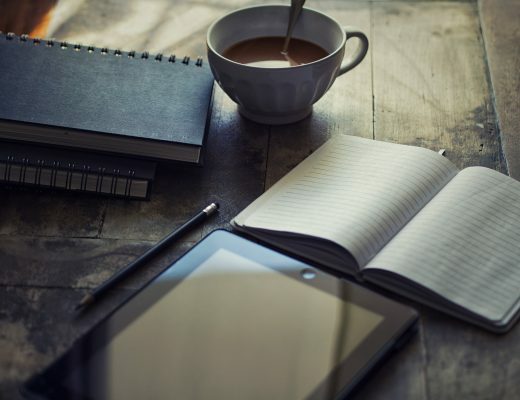 Do you have any tips and hints for aspiring writers? I’m planning to start my own site soon but I’m a little lost on everything. Would you suggest starting with a free platform like WordPress or go for a paid option? There are so many options out there that I’m completely overwhelmed .. Any recommendations? Thanks a lot! Hi Frank! Well if you are going to be based in Hobart and only have a short time I would recommend Bonorong because it’s the closest to the city and easily doable as a day-trip. As well as the Tasmanian Devils if you join one of their free tours you will get to see wombats as well and even pat a koala! 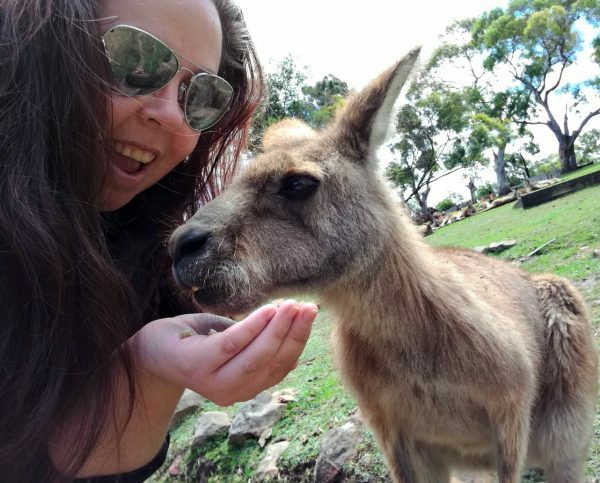 You can also feed the kangaroos and get to see other Tasmanian and Australian animals so if you only go to one, I’d probably say go to Bonorong 🙂 I hope you have a great time!